Machairodus giganteus was about the size of a lion, but had a more narrow skull and a longer nose. This is a Eurasian species of cat, yet the genus is found throughout the world. The genus first appeared in Eurasia in the middle Miocene and survived through the Pliocene. 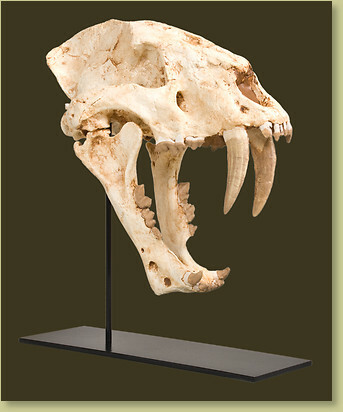 This particular skull is from one of the largest and most complete cats to come out of China. Notes Photo represents what this cast may look like if finished for display. Custom painting and/ or mounting is available upon request, for an additional fee. Please contact us with your questions.